I've been doing some taste tests in the past couple of weeks. They haven't been as successful as I, initially, thought they would be. Let's dive in and see what I've eaten lately. First of all, Oreos. These are not your run of the mill Oreos or even the dipped ones. These are two new, limited edition, flavors. As I've come to see with M&M's, limited edition usually means, "Hey, let's try something". I remember reading a news short about these flavors and set out to find, and consume, them in an effort to see just how they compared to the real Oreos. I couldn't find these at Mariano's. I had to go to Target. The premise seems reasonable enough. 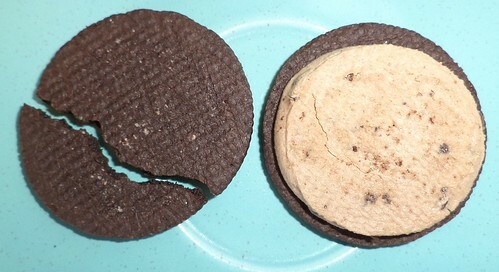 Oreos has a solid seller with chocolate and vanilla cookies. You know you can buy "blonde" Oreos as well as the regular ones. You can even buy Oreos with a chocolate and a vanilla cookie. 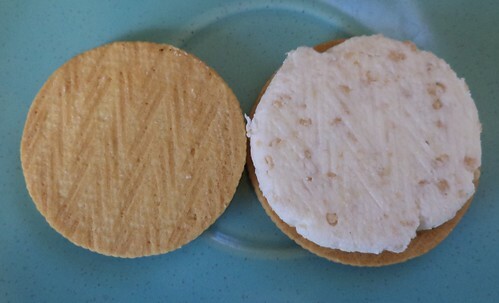 I remember seeing vanilla cookies with chocoalte middles. They are simply varying the inside creme flavor. Those are little flecks of crispy rice. The assembly process removes the "crispy" so the mouth feel is akin to creme with chunky bits. I thought I would be excited by the cookie dough version. Oberweis Cookie Dough ice cream is a favorite of mine. I should have suspected something when the front of the package reads, "Made with chocolatey chips" (emphasis mine), not chocolate chips, mind you, but chocolate-y chips. You might as well say "It's not real chocolate but someone in the factory had a chocolate bar so we're using the neighborhood rule to call these chocolate". Neither one was very good. 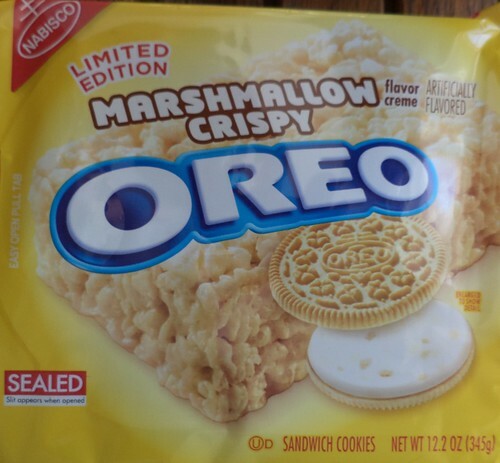 The cookie part itself was just what I expect from Oreos, crisp and sturdy, with the vanilla tasting like vanilla and the chocolate tasting like chocolate. The marshmallow was too sweet, way too sweet. I realize they were going for something approximating a Rice Krispy bar but I don't think of those as sweet as these cookies are. I didn't eat the whole package. The cookie dough cookie bore no resemblance to cookie dough ice cream. I've had Edy's and Dean's cookie dough ice cream and although I prefer Oberweis', those are good quality ice creams. The cookie dough tastes like cookie dough. This was a meager attempt at cashing in on this idea and, as far as I'm concerned, failed. 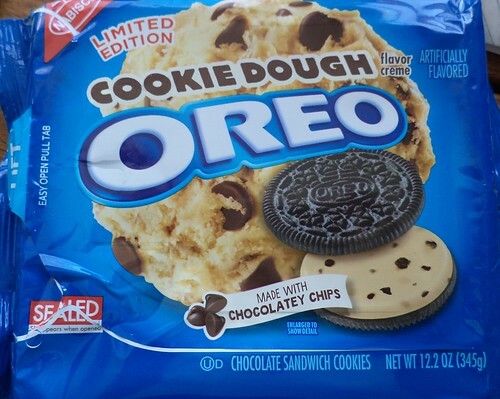 Thankfully, these are limited editions and won't replace the Oreos we know and love. Save your pennies. On that same Target shopping trip, I was craving pizza so I picked up a frozen one. It was on sale. This brand tends, in my opinion, to be consistently good in the category of "hand tossed" crusts. I'm usually leery of "new" appended to a long-time favored brand. What was it about the way you'd made your product for decades that you felt you had to "improve"? 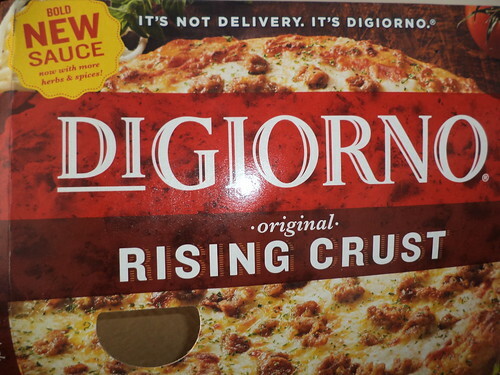 I sort of shuddered, but I liked DiGiorno and I wanted a sausage pizza. Oh dear. It was bad. They have added or increased the sugar content of their sauce. Maybe I'm more sensitive to sugar, I don't know, but, to me, pizza sauce should be about tomatoes and herbs, maybe a bit of oil as a binding agent, but not sugar. That's what I tasted, sweet. So, I look at the ingredient list. Third line, right after the "tomato paste", there it is, sugar. Because you have to list ingredients in the order of greatest to least, wheat flour is first since a pizza is mostly crust. Then comes the cheese and the sausage and then the sauce. Look on the 4th line. Sugar shows up a second time. No wonder I tasted sweet. I ate 3 pieces and couldn't eat anymore. That also went outside on the deck for the wildlife, a couple days after the Oreos. I'm still craving pizza but I'm seriously considering ordering Dominos. I haven't had delivery in months. I could order it at the office and then pick it up after work. Then I wouldn't worry about the delivery guy getting stuck in the drive. In the same trip, I wandered by the T.G.I. Friday's frozen appetizers. Everything was on sale so I bought a package of cheese "sticks". These should be really good. No, they aren't. These are what I wanted. These are from Arby's. When I think cheese sticks, this is what I think of. It's a chunk of mozzarella, rolled in a breading and deep fried. Now, I don't do deep frying anymore. As with any kind of food, moderation is the key but I just didn't want to store used oil for long periods of time. It will go rancid and, if you've ever smelled that, you know it's not pleasant. So, I baked the sticks, which were more like blocks than sticks. I don't have a photo of them, but they turned out to be almost like cheese-flavored sticks. The ooey gooey strings of cheese that one associates with sticks like Arby's wasn't there. I had a nearly empty shell of breading instead of cheese. Even on sale, they were a huge disappointment and I won't be getting them again. I'll stick to satisfying the deep fried cheese cravings with Arby's. So, there you have it. These things aren't, in my opinion, worth your dollars to purchase. I'm not all that disappointed in the Oreos. Having tried and survived the pumpkin in everything craze at Halloween, I guess my expectations for a "new" and "limited time" flavor are low. But the pizza is a disappointment to me. I could write Nestle's a letter expressing my sadness at the change, but I fear they will send me a coupon for a free pizza and I won't touch DiGiorno's again. Save your pennies. 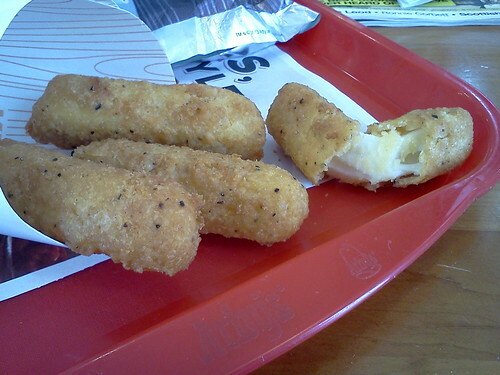 Once every 3 months, head over to Arby's and get yourself real cheese sticks. Order delivery pizza and bake yourself some cookies. The latter covers two items. There's a lot to be said for home made cookie dough.